The ingredients in Arthur Schwartz’s recipe for Pasta e Fagioli in Naples at Table are very humble – beans and pasta are the main ingredients. When combined, however, as they are in this classic dish from Naples, they become a comforting meal that is full of flavor. It makes you think you are in an Italian trattoria. The night before making it, I soaked some chickpeas and then cooked them the next day. Ready to prepare Pasta e Fagioli, I pulled out Naples at Table and realized that the recipe calls for cannellini beans, not chickpeas! Oops! I had so wanted to make a classic version of Pasta e Fagioli. I turned to Frank Fariello’s excellent blog, Memorie de Angelina. 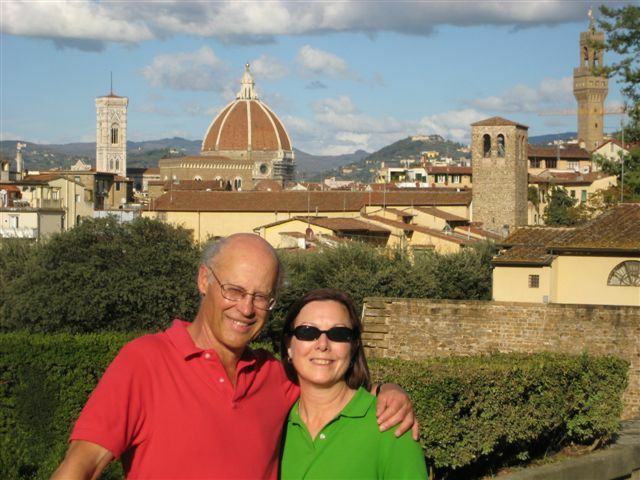 Frank has a recipe for Pasta e Fagioli and he also uses cannellini beans. 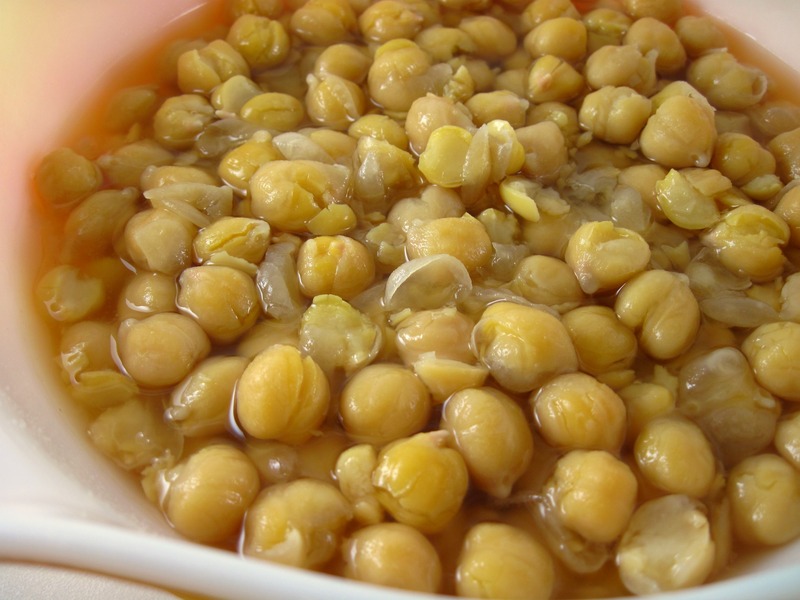 However, he points out in his notes that other beans can be used, and chickpeas are a wonderful choice! Yay! 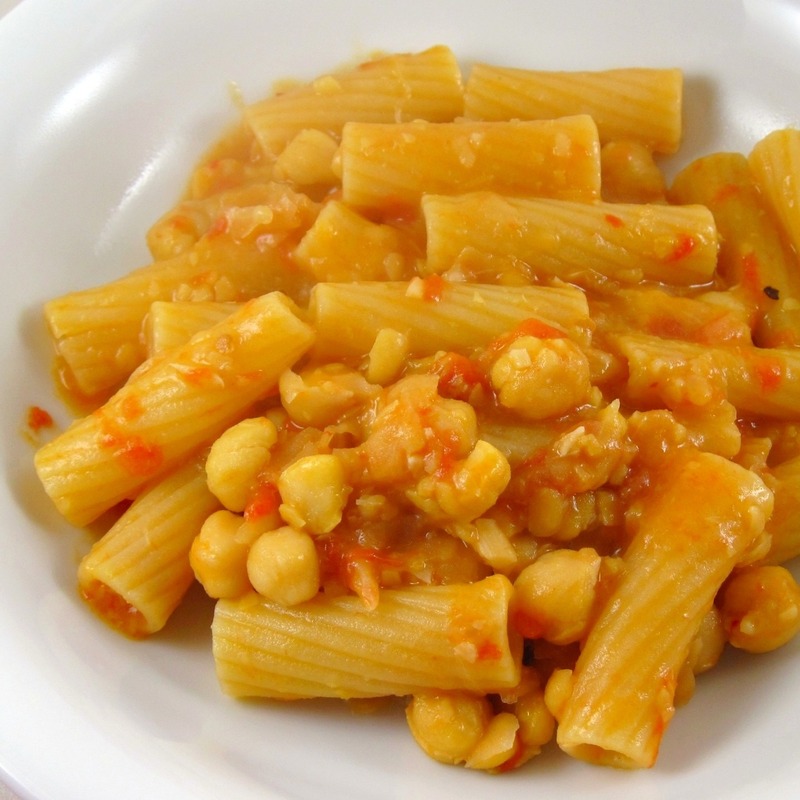 When made with chickpeas it is called Pasta e Ceci! That works for me! 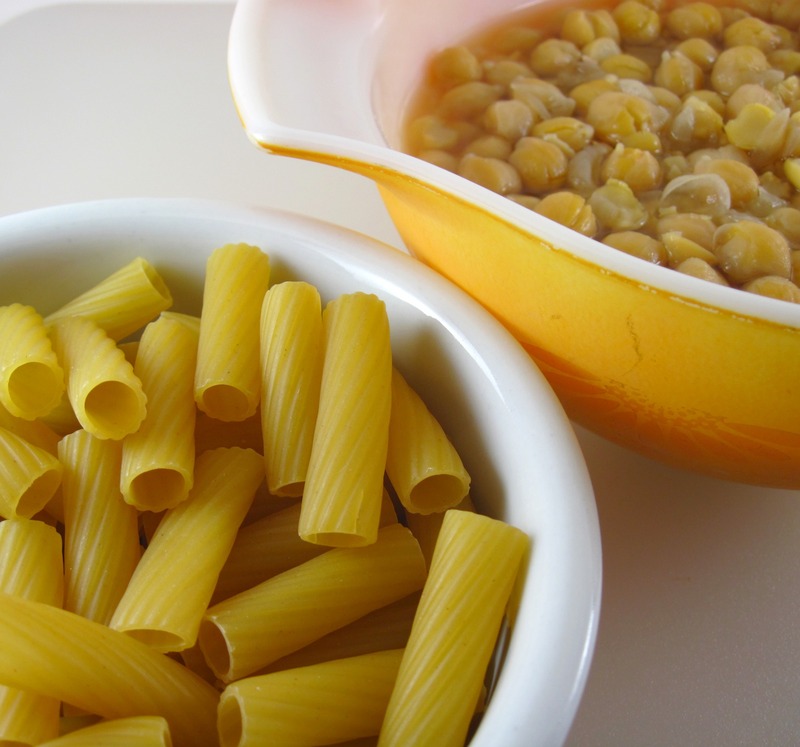 At a typical meal in Italy, Pasta e Fagioli, or Pasta e Ceci, would be served as a Primo (first course) followed by the Secondo (the main course, usually featuring meat). At our house, though, it made a fantastic vegetarian dinner served with bread and a salad! 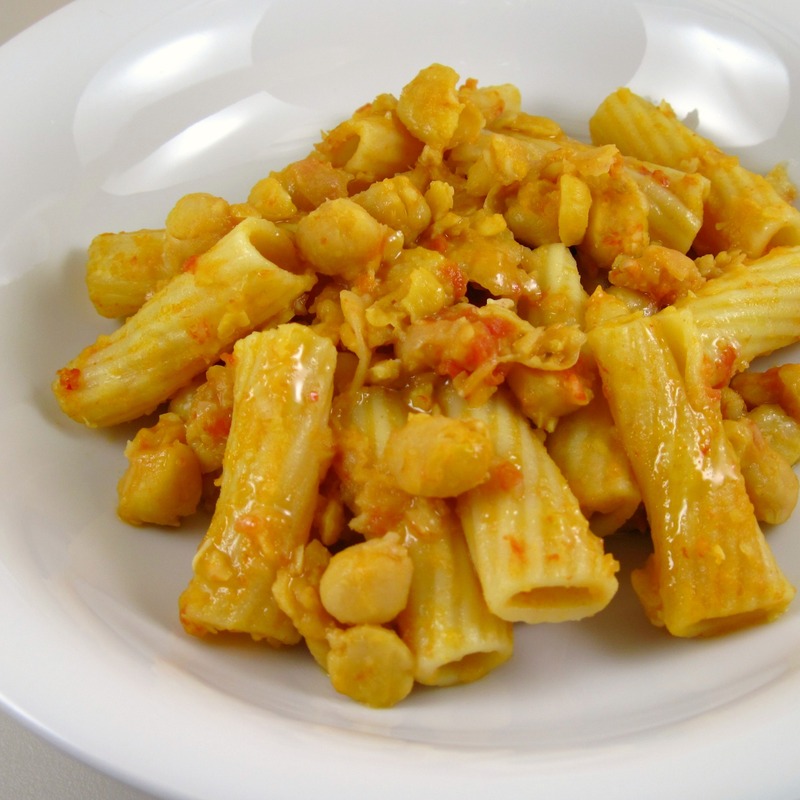 Such a humble-looking dish, yet so delicious – Pasta e Ceci! 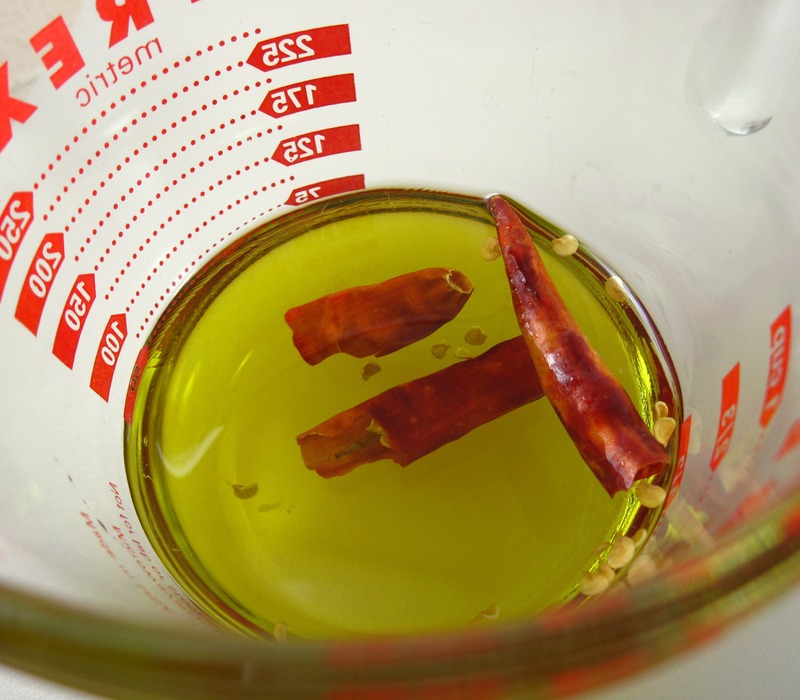 Break 1 or 2 dried hot chilies (any variety), seeds and all, into ¼ – ½ cup extra-virgin olive oil. Let soak for several hours. 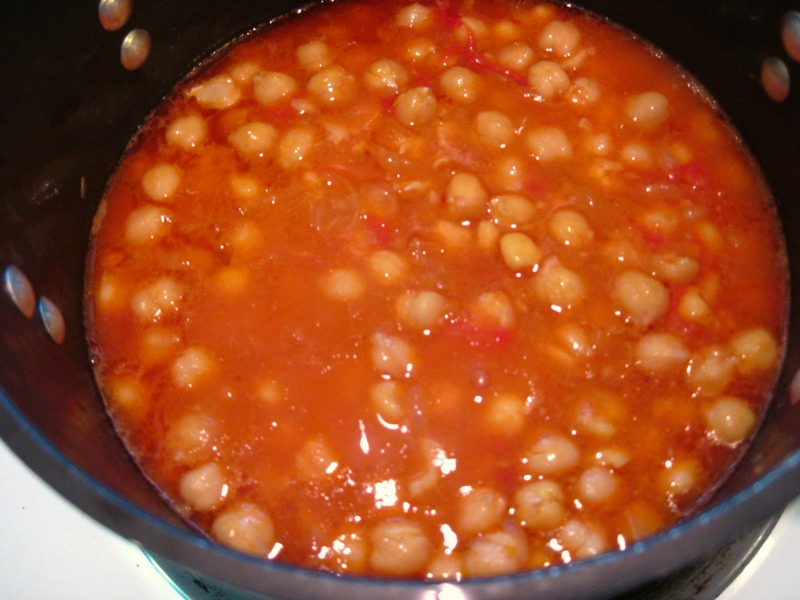 Put 1 cup cannellini beans or chickpeas in a large pot. Cover with water so there is at least 2 inches of water over the beans and soak overnight. If you don’t want to soak them overnight, cover with water so there is at least 2 inches of water over the beans. Bring to a boil and boil for 5 minutes. 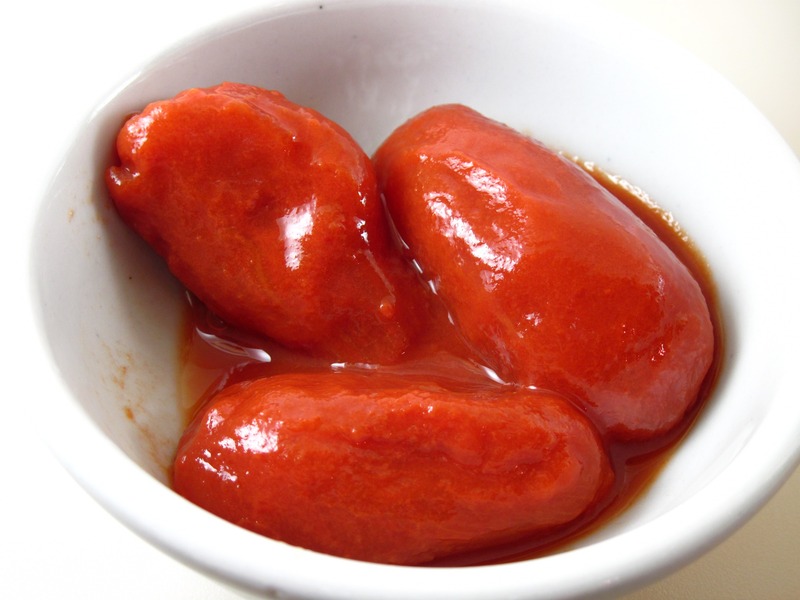 Remove from heat and let them sit, covered, for 1 hour. Drain the beans, reserving enough broth to cover them. 2. 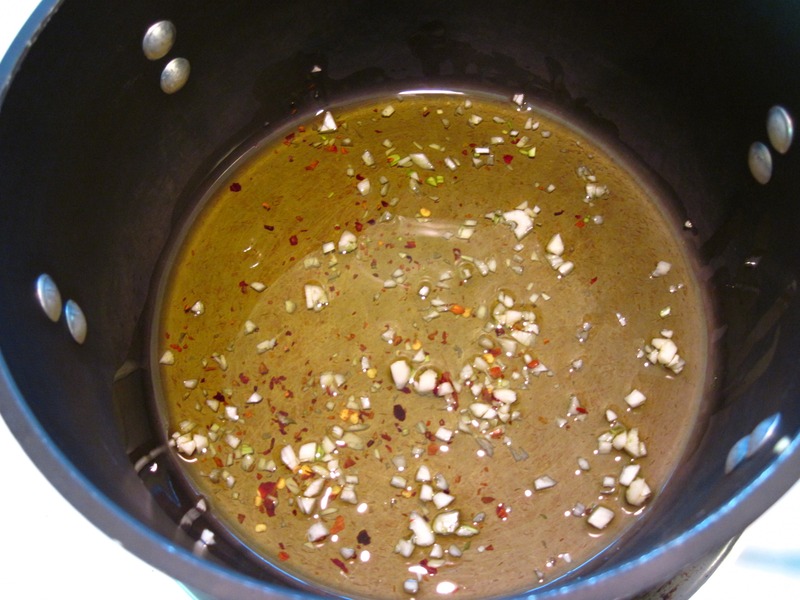 Put the ¼ cup olive oil, garlic, and pepper flakes in a 2½ – 3 quart pan. 4. 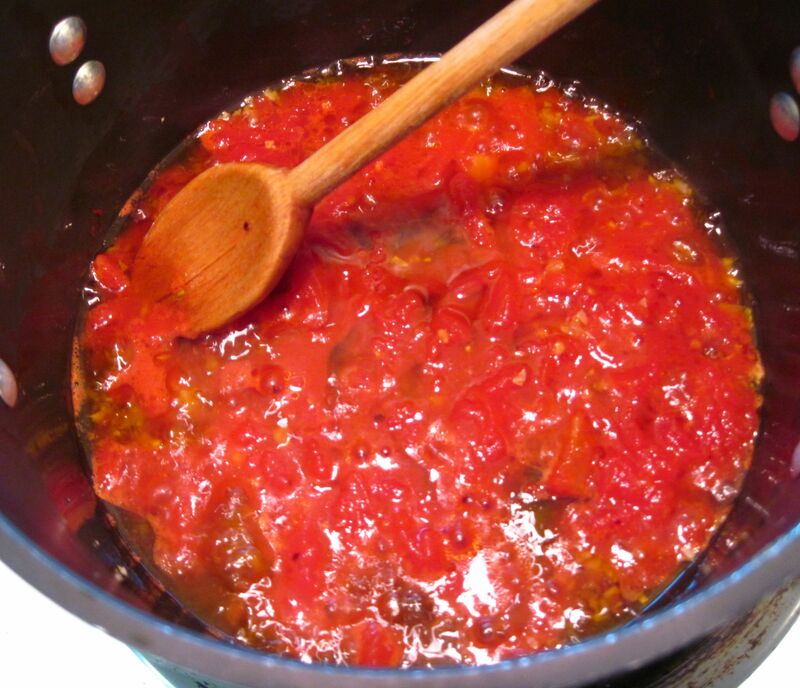 Add the salt and simmer the tomatoes for about 5 minutes, stirring occasionally and breaking up with the back of a wooden spoon, if necessary. 5. Add the beans and their liquid, and simmer for about 5 minutes, stirring occasionally. Using a spoon, smash a few of the beans against the side of the pan. 7. When the pasta is done, reserve ½ cup of the cooking water and then drain the pasta. Add the pasta to the beans; stir and cook for about 2 minutes so the pasta can finish cooking and absorb some of the flavors. Add a bit of the reserved pasta water if it seems too dry. 8. Cover the pot, remove from the heat and let it sit for 5 – 10 minutes. 9. Serve and pass the Hot Pepper Oil at the table to drizzle on top of individual servings. An old time favorite of ours and yours looks fantastic! Oh Ryan would just love this! He doesn’t eat any meat and comes from an Italian background. I will be making this for us soon! Thank you for sharing with me…and for making me smile. Your words are a source of joy in my life, and in the lives of many others. I hope you have a happy Friday. The weekend is almost here, and I’m ready for it!